Finally, a return of Sally’s Helpful Hints! Storage solutions edition. Last summer, I solved a small problem involving my kitchen. I have terribly small useless kitchen cabinets set up in an inconvenient configuration. So, my storage space in the kitchen is at a premium. But I also have a crap-ton* of water bottles that I use for workouts and on the bike. I originally saw this idea on another triathlete’s blog** a long time ago, but only recently implemented it. 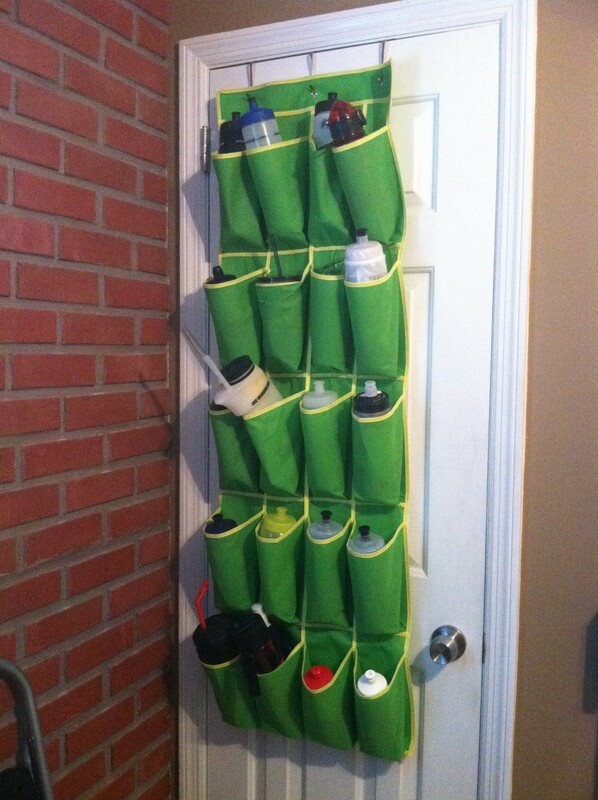 Using an over-the-door shoe organizer to store my water bottles. Now they are neatly organized (along with matching lid) out of the way and not taking up precious cabinet space. I can easily grab them, fill up, and head out the door. So, recently I was accumulating quite the stash of nutrition; protein bars, Gus, chews, nuun, etc. I could no longer neatly stack them on a counter, and I never knew just how many I had of anything. I would have to dig through a stack, usually knocking more crap over, to get to what I wanted, digging it out of a box or wondering where that lone Clif Bar went. So I decided to find another storage solution. I originally thought some shelves or fancy drawer system hung on a spare wall would be great. Until I found this. Boom! 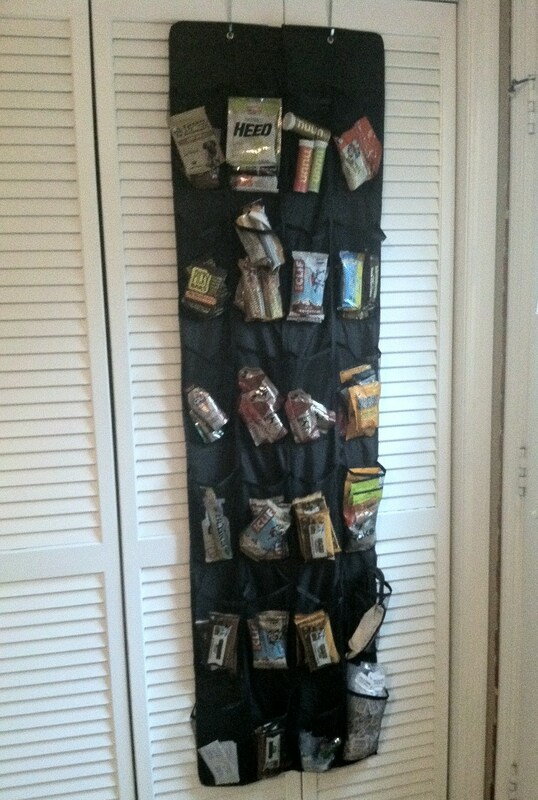 Again, the over-the-door shoe organizer rocks my world! This one has mesh pockets so I can see exactly what’s in each pouch and approximately how many I have. So if I’m running low on Clif Shots or have WAY too many energy bars I know. I can easily grab what I want based on flavor and needs and head out the door. No more digging or causing nutrition avalanches in my kitchen. Now, I think I need to replace my water bottle holder with one like the nutrition holder that has 24 instead of 20 pockets! ** I don’t remember who it was, so sorry for not giving the proper acknowledgement.